Photo by Samara Pearlstein. Artwork by C. Galloway '17. 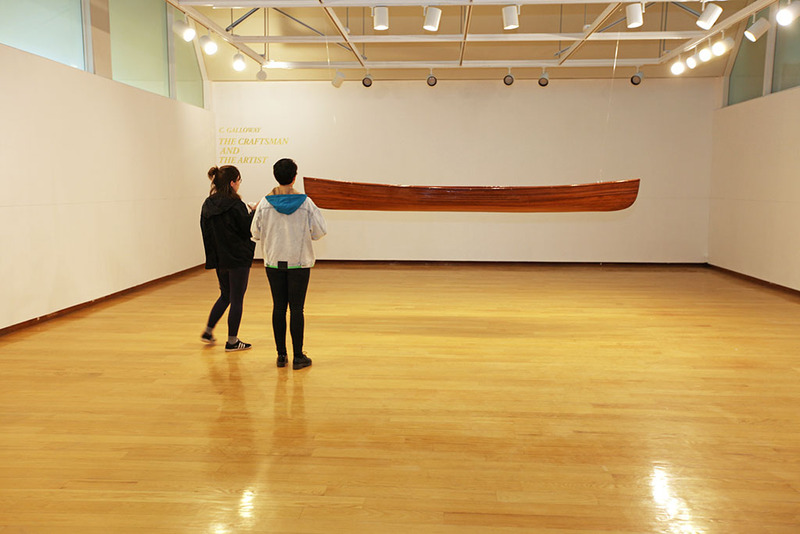 The Jewett Art Gallery is a cherished Art Department exhibition space and an extended teaching facility of the Studio Art Program. The Department hosts a number of exhibitions annually, which include faculty and student-organized events, experimental and collaborative projects, exhibitions of work by fellowship-winning alumnae, and curated shows of work by visiting artists. Each Spring, the Department features our thesis show and senior majors exhibition. In addition to the Gallery, several other spaces, such as the Jewett Hallway Galleries, the Visual Study Room, (a project space for new media), and the Sculpture Court (located on the third floor) are used for special exhibitions and experimental installation projects. The studio hallways of Jewett and Pendleton West often present informal displays of studio course work in progress. Receptions are held for Jewett Art Gallery and Sculpture Court exhibitions to celebrate and engage with the artists on view. Gallery talks and/or studio discussions are held in conjunction with many exhibits to further inform and provide an inside look at the artistic process. These events are free and open to all. There are no entry fees to view Art Department exhibitions. The Jewett Art Gallery hours are typically Monday - Friday 10:00 am - 4:00 pm, Saturday - Sunday 12:00 - 4:00 pm. The Gallery may not be open on certain holidays. In general, if the Art and Music Libraries are closed (see link here), the Gallery will be closed. If there is a scheduled event at the Gallery that has to be canceled or rescheduled due to weather or other circumstances, an update will be posted on the Gallery Facebook page. The Jewett Art Gallery is the first thing you see when you enter the main doors of the Jewett Arts Center. All of campus is located at 106 Central St, Wellesley MA, but you may need to drive a little past that address to reach the actual entrance. Free visitor parking is available in the Parking Garage immediately to the right of the main Central St. (Rt. 135) entrance. When you exit the parking garage, walk past the Lulu Chow Wang Campus Center, walk past the Physical Plant, and approach the Davis Museum from the back. There are stairs that go underneath the Davis; take those stairs up and you will find yourself on the Davis Plaza. You will be facing the back of the Jewett Arts Center. Go up the stairs underneath Jewett to access the main quad. At the top of the stairs, turn around and you will be looking at the front of Jewett. If you need our accessible entrance: there is a ramp on the right side of the building (if you are coming up from the Davis; the left side if you are coming from the quad). Take the elevator up to the 2nd (main) floor. You may also get to Jewett by way of a short bridge from the 2nd floor of Pendleton West, which has numerous accessible entrances. If you still have questions about how to find our building, please call the Art Office at 781-283-2044. See some past images from student and visiting artist exhibitions.